Midmark has brought together the best features and most proven technologies to deliver one complete Air Compressor and Vacuum product offering, satisfying the high standards demanded by today’s dental professionals. 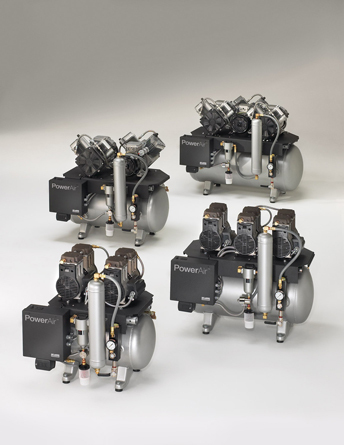 From the Wet-Ring Vacuums and Lubricated Air Compressors of the Classic Series to the Oil-Less Dry Vacuums and Oil-Less Air Compressors of the Power Series. 01 micron coalescent filter (500 times greater filtration than the industry standard. The Midmark ClassicSeries® Lubricated Dental Air Compressors bring together the best features and most proven technologies into one uniform offering. These compressors satisfy those who have grown to appreciate the high standards created by Apollo and Matrx brand lubricated compressors. 01 micron coalescent filter (500 times greater filtration than the industry standard) eliminates common contaminants. Providing unrivalled performance, KAESER’s "Permanent Power System" (PPS) enables up to 90 percent compressed air availability. To regenerate the desiccant in the SECCOMAT dryer, the PPS uses a highly efficient process whereby fresh ambient air is drawn in and warmed via the compressor and then passed through the dryer. 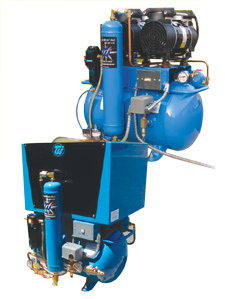 This technique has several key advantages: Firstly, the resulting internal cooling of the compressor block increases efficiency and service life. Secondly, the warmed air is perfect for purge air as it can carry far more moisture than cool air. This process is also much faster than conventional regeneration methods which use diverted compressed air that is cooled as a result of subsequent expansion. 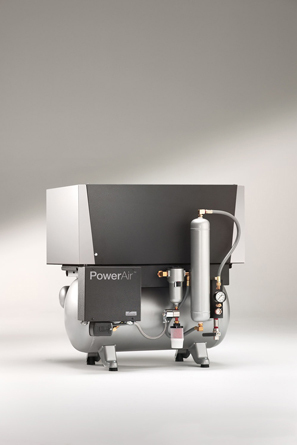 Consequently, the KAESER “Permanent Power System” significantly extends the compressed air system’s power phases and enables unprecedented compressed air availability. KAESER compressor blocks are made from materials of the highest quality. Produced in Coburg, Germany, each component is manufactured, inspected and assembled with meticulous care and precision. 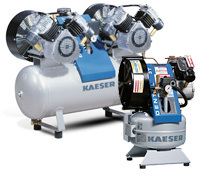 Together with KAESER's innovative "Permanent Power System", these durable compressors provide outstanding performance and unrivalled energy efficiency. Both piston rings and the guide ring for each piston are Teflon-coated to ensure maximum durability. 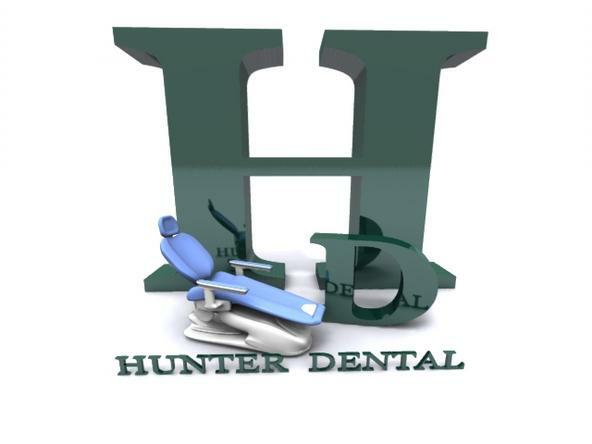 Moreover, they are easy and inexpensive to replace should the need arise and, as a result, further extend the exceptionally long service life of KAESER Dental compressed air systems. Tech West Ultra Clean Oil-less Air CompressorTech West’s Ultra Clean Oil-less Compressor supplies 100% oil-free air to the dental office environment. Tech West guarantees the clean, dry air you expect from a high performance drying system. Through its smooth, vibration-free running at 72 DB, the Ultra Clean air compressor prevents the expensive and inconvenient need for a sound cover. All oil-less Tech West compressors are equipped with energy efficient heads, large cooling fans and Teflon-coated pistons and cylinders that provide years of dependable service. The Ultra Clean features moisture indicators, epoxy-coated tanks and rubber-leveling feet, along with handles for easy lifting and installation. The Tech West Ultra Clean Oilless compressor is offered in a variety of configurations from a single unit to dual or triple units. Tech West provides an extensive warranty program, as well as, upon request, full plumbing and electrical assistance. Tech West Ultra Clean Lubricated Air CompressorThe Tech West Ultra Clean Lubricated Air Compressor provides clean, dry and oil-free air you can depend upon. Fresh air intake filters remove dust and dirt and other airborne pollutants from even the busiest dental office environment. Tech West’s vibration free motors are designed for energy efficiency, enabling equipment to run without boost transformers thus minimizing operating and upfront costs. All compressors are equipped with energy efficient Copeland heads and large cooling fans which provide years of dependable performance. The Ultra Clean Lubricated Air compressor comes complete with moisture indicators, epoxy-coated tanks, rubber-leveling feet and handles for easy lifting and installation. Available in single, dual or triple configurations, all compressors feature Tech West’s extensive warranty program along with full plumbing and design assistance as needed. 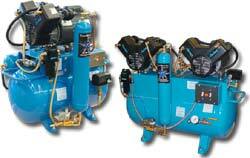 Tech West’s Rocky Oil-less Compressor Series supplies 100% oil-free air to the dental office environment. Tech West guarantees the clean, dry air you expect from a high performance drying system. Through its smooth, vibration-free running at 65 dB, the Ultra Clean air compressor prevents the expensive and inconvenient need for a sound cover. All oil-less Tech West compressors are equipped with energy efficient heads, large cooling fans and Teflon-coated pistons and cylinders that provide years of dependable service. The Rocky features moisture indicators, epoxy-coated tanks and rubber-leveling feet, along with handles for easy lifting and installation. 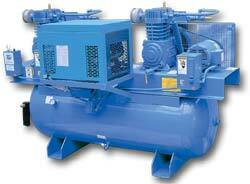 The Tech West Rocky compressor is offered in twin, triple, and quad head configurations. Tech West provides an extensive warranty program, as well as, upon request, full plumbing and electrical assistance. 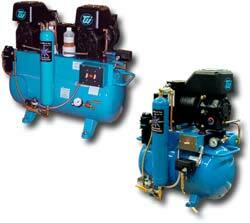 Tech West Ultra Clean Large Facility Air CompressorThe Tech West Ultra Clean Large Facility Air Compressor leads the industry in design, quality and performance, delivering guaranteed clean, oil-free air to the larger dental facility. Incorporating an energy efficient motor, fully enclosed OSHA approved fan guards, magnetic motor starters with overload protection and discharge air coalescing filters with regulator, the large facility air compressor also comes standard with a refrigerant air dryer. All compressors come wired for 24V remote switching ready for installation. In addition to a full two year warranty, Tech West will provide plumbing, electrical and installation assistance as needed.